There are 2 double sided boards that come with the game. Each side has a map scaled to fit the number of players from 2 to 5. Maps need to ensure the world is small enough to create conflicts, so the 2 player map has much less room than the 5 player one. The map is divided into regions that you will conquer. At the end of your turn you will earn 1 Victory Coin for each region you control. The player with the most Victory Coins at the end of the game is the winner. There is a set number of turns to play also scaled to the number of players. In a 5 player game, you will get 8 turns and in a 2 player game you will get 10. At the beginning of the game you will add the Mountain and Lost Boy tokens to marked places on the board. The Mountains represent difficult terrain to conquer and the Lost Boys are the last declining race on the board waiting to be conquered in the onslaught to come. You start the game with 5 Victory Coins and these are your currency for buying your army. The top of the line up is the pile of upcoming races (underneath the Fortified Humans). The race at the bottom of the line up will cost you zero and each race above it will cost one Victory Coin for each tile below it. There is a unique mechanic in that the coins you pay go onto the choices you bypassed. For example, if you chose the Hill Skeletons, you will need to put 3 Victory Coins, 1 each on the Ghouls, Ratmen and Sorcerers. These Coins will stay on the tiles until that tile is purchased and the player who purchased it will add those Coins to their own treasury. This makes sure that weaker Race and Power combinations will soon become more tempting the more they are passed up and that powerful combinations are paid if you have to bypass a lot of tiles to get them early. You will now start conquering Regions. To do this your army can enter the map on any outer edge boarder (including coastlines along the sea); you can't start your conquering in the middle of the map unless you have a special power that allows you to do so. To conquer an empty region, you need to place at least 2 of your race tiles on that region. Each tile you use to conquer this way will stay in place until the end of your conquering phase. All your following attacks will now need to target regions adjacent to regions your active race controls. If you choose to conquer a region occupied by another race, you need the basic 2 tiles plus an amount of tiles equal to the number of enemy tiles on that region. For example, if you want to take a region occupied by a single Lost Boy token, you need at least 3 of your tiles to do so. The defeated Lost Boy Token is removed from the map. If you want to Conquer a region occupied by 3 of your opponent's tiles, you will need 5 of your Active race tokens to take it from them. They will discard one of the defeated tokens from the game and re-deploy the remaining two at the end of your turn on regions they occupy. The single Troll tile is occupying a plains region. it has a Troll layer built, so you will need 4 of your army tiles to conquer it. There are 3 Orc tiles occupying the Mountain region, so you will need 6 of your tiles to conquer it. After you've used all of your tiles from your hand to conquer regions, you may end your turn by redeploying your tiles. Simply put, you can just move your tiles around any way you want on your occupied territories. You collect 1 Victory Coin for each Region you control. When it comes to your turn again, you can pick up tiles from your regions. Usually you leave at least 1 behind on each region so it remains occupied earning you coins at the end of your turn. For example: if you occupy 3 regions with 3 tiles on each, you could pick up 2 tiles from each and have 6 in hand to now conquer with. You repeat this process on your turns until you feel your Active Race/Power combination has extended to the maximum of it's potential. If your Active Race is occupying 8 regions with 8 tiles, it's probably time to go into Decline and pick up a new Active Race. At the start of your turn, if you are going to go into Decline, you will remove all but 1 tile from each of your occupied regions from the game. Then you will turn the remaining single tokens over to the gray side, indicating it is a Race in Decline. You will also turn your Race and Power tiles in front of you over. If the Power tile doesn't have an in decline power, it is also discarded. You will still count the regions you control and they will earn you Victory Coins at the end of each turn. Races in Decline can not attack or re-deploy any more, they will just earn you Coins for as long as they can stay in play (unless you have a race that has in Decline powers). At the start of your next turn, you will get to purchase a new Race and Power combination, and repeat the above process. You can control 1 Active Race and 1 in Decline Race at a time. If you have a 2nd Race go in decline while you still control an old Race in Decline, you will remove the oldest in Decline Race from the game. That is basically how you play the game and it will end when the pre-determined number of turns have been taken. What makes Small World interesting and full of re-playability are the Race and Special Powers. I won't go into detail here as the fun is discovering each Race's powers and the interesting combinations that are made with the Special Power tiles. Each player has a cheat sheet explaining the powers in a little more detail that you can reference as they come up so as not to overwhelm the learning process. After a few games, reading the iconic short hand on the Race and Power tiles becomes second nature. 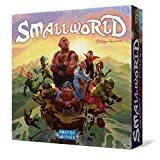 There are many expansions that add many more Races and Powers to the game. Days of Wonder even held a contest for fans to submit their own ideas to be used in the expansions. Be Not Afraid, Grand Dames and Cursed! are all worthwhile additions. 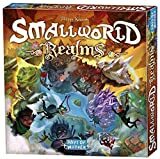 There is also a new stand-alone game based in the Small World game that goes underground with some new mechanics and all new Races, Powers and Maps to explore called Small World Underground.